When it comes to large home projects, I do my research. Before reaching out to any companies or contractors I’m considering working with, I like to have an idea of what I want so I can provide clear guidance to whomever I choose to work with. At Archadeck Outdoor Living, we recommend our clients visit our website to get patio and deck ideas to spur our thinking. Everyone’s tastes, styles and budgets are different. What works for me and my house may not work for my neighbor. Looking at images will inspire likes and dislikes that should guide your designer to create an outdoor living space that you love and complements the structure and finishes of your home. Color and Material – Fifteen years ago, the majority of decks were wood. If you like the natural wood look, look at different types. Do you like the standard pressure treated pine? Or maybe the IPE is a better option for you. 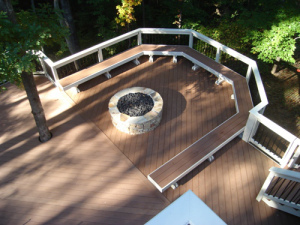 Between decking stains, paint and composite options, your designer should be able to find the perfect color for your deck that enhances your outdoor space. 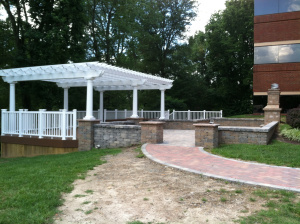 Material is also a key component of patio design because the options are so varied and are a large part of the design. 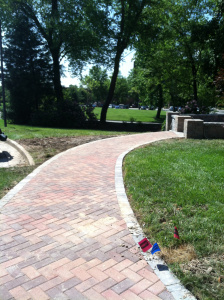 Some people prefer the look of the traditional red brick, while others like a more natural flagstone finish. Skirting – Unless you keep the space beneath your deck in beautiful shape, you may want to include some type of skirting to your design. Skirting gives the deck a finished and streamline look while adding another detail that some homeowners may not think of. A few types of skirting are lattice and solid board skirting. Lattice skirting, as seen to the left, has a crisscross look that you may also find on privacy walls. Solid board skirting can be installed in both vertical and horizontal patterns and is similar to the finished look of a fence. 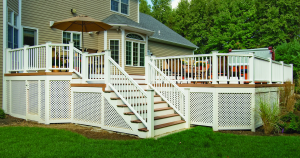 Railings – Railings are not only necessary for safety concerns, but they are also a great place to add a design feature. From iron and glass to vinyl and wood, there are options of every kind. Built-in features – the last component I would look at for ideas is built-in features. These can include anything from fire pits, fireplaces, kitchens, benches, planters and more. I personally like something that’s a little more functional, so while I think a planter is great, I would add a wider border to it so it can also work as a bench. Other people, however, are fine with just having something that looks great. 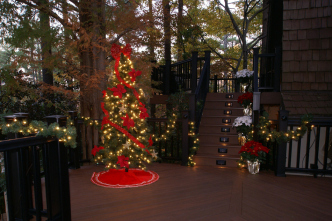 To get some patio and deck ideas that may work for your space, take a look at The Archadeck photo galleries. 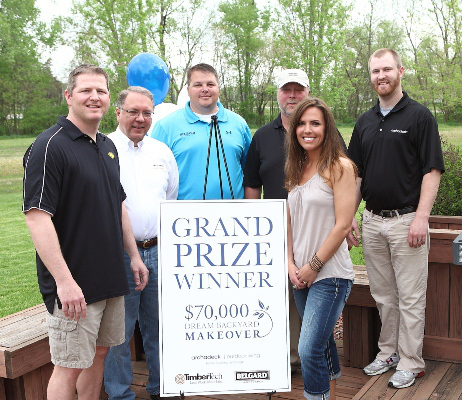 Also, if you want your Dream Backyard and want us to do all the thinking and doing to make it happen, don’t forget to enter the Dream Backyard Makeover Contest. 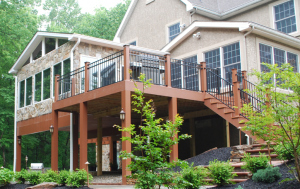 At Archadeck Outdoor Living, our motto is “better building by design.” We take great pride in the fact that each and every one of our outdoor living projects is different and custom designed to fit the homeowner’s needs, tastes and budget. We have a needs assessment that guides our designers as they create the perfect space for their clients. 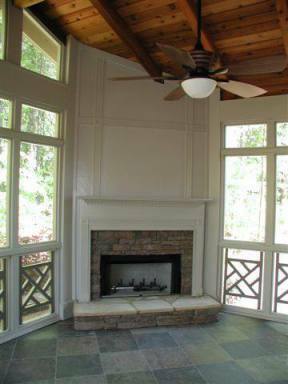 Our deck builder in Hawkinsville, GA recently created an outdoor living space using an old feature of the property as his inspiration. 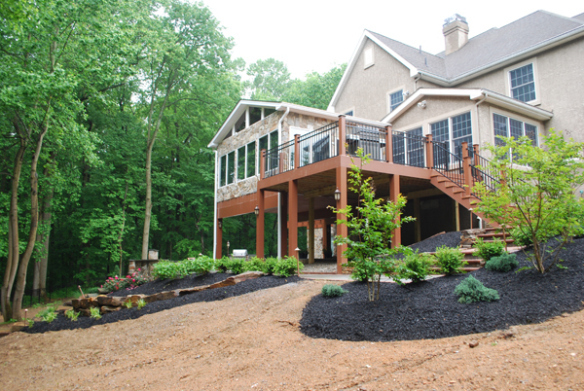 Stephen Denton, the owner of Archadeck of Central Georgia, was asked by his clients to create a deck design around an old well that the home had. The house was built in the 1800s and had some beautiful charm as a result of its age. The old well had been filled in and works as a flowerbed, but the homeowners did not want to get rid of it due to the history behind it. Instead, they wanted a unique outdoor living space that mirrored its shape, thus the curved deck was born. The curved edges of the deck enhance the curve of the well that sits in the center of the deck. 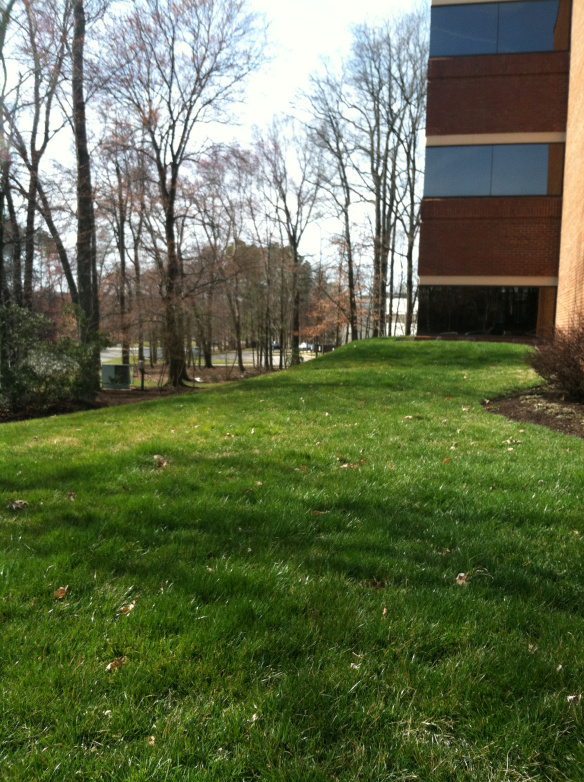 Rounded decks, however, don’t work on certain properties due to the landscape. In general, decks must having railings for code and safety issues (no one wants an injury), but curved railings are expensive. They have to be specially made because you can’t bend wood or rail caps to follow the unique curve. 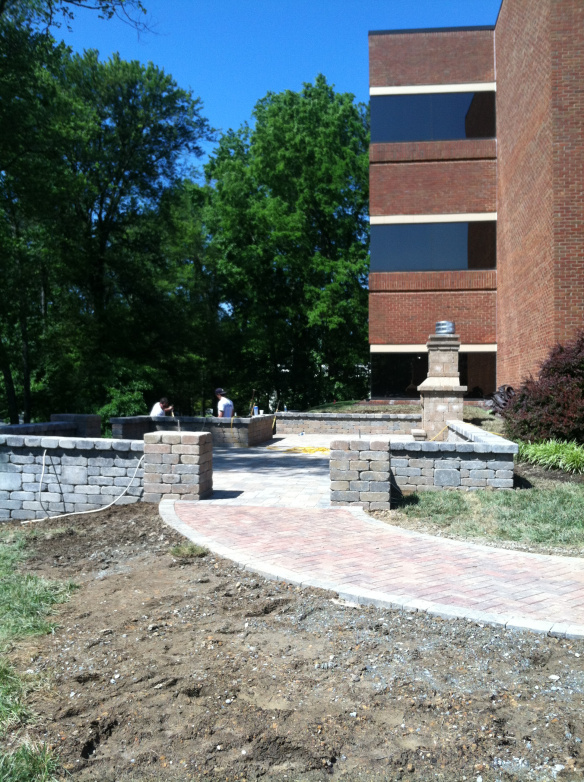 Luckily this project didn’t need to have railings. 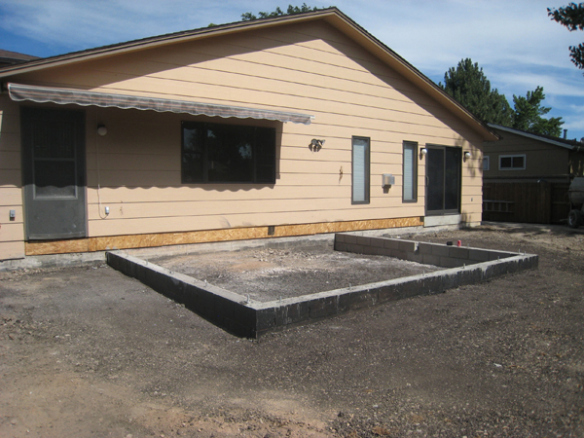 The evenness of the yard allowed Stephen to build a low-to-grade deck which means the structure is low to the ground. 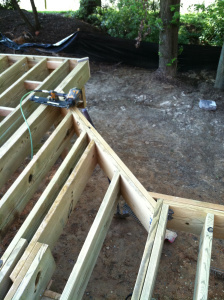 If the deck is less than 30 inches off the ground, code says that the structure doesn’t need railings, so the sides of this project were left open. The homeowners are thrilled that the view from their deck isn’t blocked by railings and is completely open to the backyard (not to mention it saved them money). Railings were added to the straight edges of the deck and stairs so visitors have something to hold on to while traveling around some parts of the space. 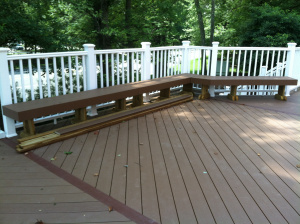 The railings on the side also give the deck added definition. 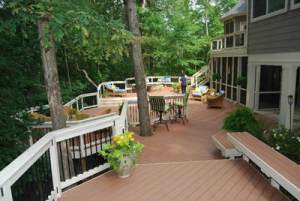 When considering what the deck in Hawkinsville should be made of, the homeowners were clear: they wanted low maintenance. Stephen used TimberTech composite decking in a deep walnut color so his clients can easily keep the space looking like new and don’t have to worry about rot, mildew or bugs as the boards age. Archadeck of Central Georgia was able to build the deck without breaks in the boards too. No two boards are right next to each other on the ends, creating a clean finished look. 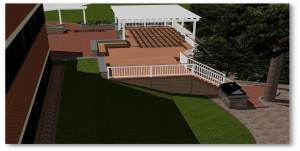 The last part of the deck design was the trellis. Not only can the homeowners use it as a place to hang or grow vegetation, but they also added an outdoor curtain that they can open and close for added privacy. 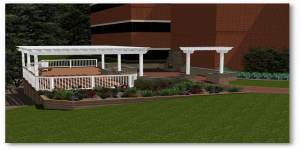 I love projects like these where a request to keep and highlight a special feature, like this well, drove the deck design. It’s a unique project that the homeowners love. It’s functional, yet charming. To learn more about designing an outdoor living space that you and your family can enjoy, download the Archadeck Design Guide, or contact your local Archadeck office. It is time to turn the spotlight on another Archadeck location that is doing spectacular outdoor living designs that are not only beautiful but functional as well. This creation by Archadeck of Chester County includes a sunroom, deck, outdoor kitchen and a custom fire pit located on the lovely patio. 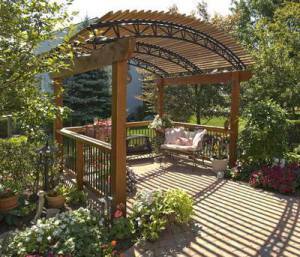 It also includes a stone trimmed built-in spa, not to mention a gorgeous pergola for the icing on the proverbial cake. This combination of outdoor structures gives new meaning to the term “stay-cation” because with a outdoor living area as well-appointed as this, who needs to leave the comfort of their backyard home to renew and relax? When Juan Cardona and the design team at Archadeck of Chester County met with these homeowners in Kennett Square, PA, which is known as the mushroom capital of the world, to create this masterpiece in outdoor design, they had an existing deck that was in dire need of replacing as well as an open deck at the rear of the home with an unsightly concrete slab patio under the deck. The homeowners wish was to create an outdoor area that incorporated a sunroom, less deck and a patio on the lower level. They also wanted to include a built-in cooking area, spa area, and a custom fireplace or fire pit to accommodate their desire to have room and suitable entertaining areas for larger gatherings down below as opposed to having an all-open deck on the second level. 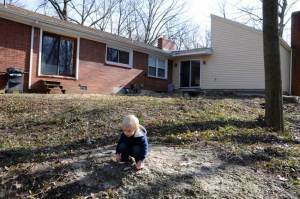 The obstacle that had to be overcome was the fact that their yard was on a rather severe slope. 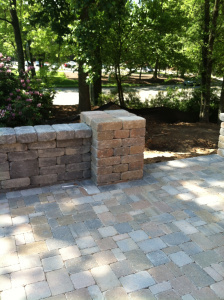 In order to deliver the outdoor oasis the homeowners desired, we would have to install some retaining walls to make it happen. 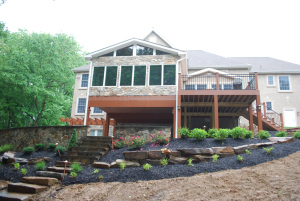 Archadeck of Chester County, PA teamed up with a professional stone mason and together, they quickly put together an integrated plan to totally re-build and re-structure the entire rear of the home. The extensive use of stone walls was used to match the overall look of the existing home, since the entire front of the home was already finished in stone. The suggestion of using stone within the new design offered a dramatic look that harmonized well with the existing property. 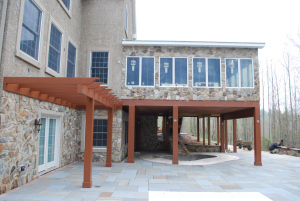 The deck was constructed using low maintenance TimberTech XLM in Mountain Cedar which harmonizes perfectly with the old world appeal of the stone used throughout the project. Archadeck of Chester County black Fortress iron railings on TimberTech posts for continuity and fluidity in the deck’s design. 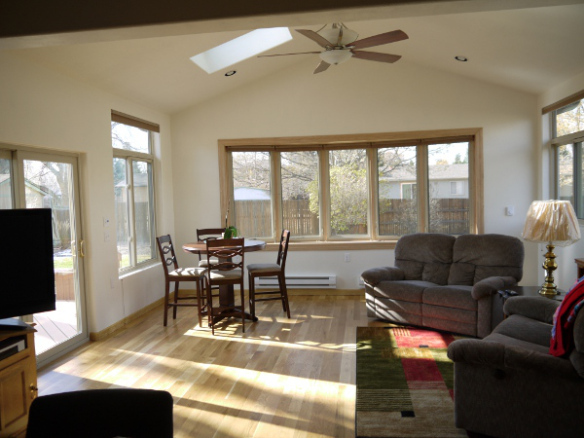 On the interior floor of the stunning sunroom they used IPE tongue and groove flooring. 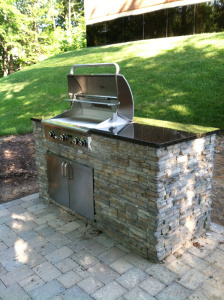 The exterior of the room was finished with a stone veneer to match the rest of the patio which includes stone retaining walls, an outdoor kitchen and a custom fire pit. The sunroom also includes Anderson windows. Under the sunroom there is a built-in custom spa also trimmed with stone. 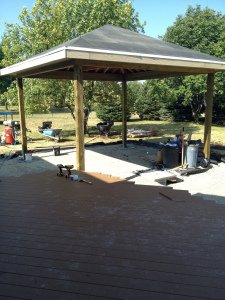 The finishing touch to the project was the addition of a maintenance-free pergola of AZEK composite that was painted to match the decking color. The whole design flows effortlessly from structure to structure and looks and feels original to the existing home, which requires perfection in the design and the execution of the design in order to achieve. 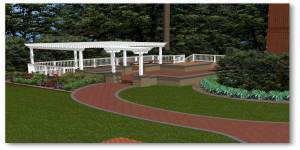 If you are ready to turn your backyard into an orchestrated oasis of beauty, style and relaxation, contact Archadeck today and you will be on your way to creating beautiful harmonies within your own little slice of heaven. 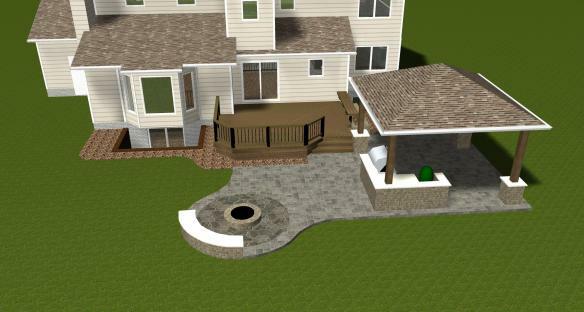 Schedule a free design consultation or contact us by calling 804.353.6999 or emailing us at [email protected] locate an Archadeck near you to get started. Have you ever wondered just why things that claim they are “better” than the original often emulate characteristics of the very thing they are touting they are better than? I use yesterdays breakfast as an example. I was cooking turkey bacon along with eggs and toast for me and my family. 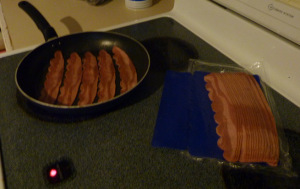 Now, turkey bacon does not claim that it is better tasting than the regular pork bacon that we are all familiar with, it does however emulate the “look” of turkey bacon with its perfectly scalloped edging and striping which is added to make the turkey bacon look more like “the real thing”. The turkey bacon is indeed better for us, it is lower in fat, sodium and cholesterol. In the big scheme of things the turkey bacon is better from a health standpoint. I then wondered since it is obviously the better choice then why did the company who made the turkey bacon find it necessary to add the little aesthetic touches to emulate real bacon? After some thought I then realized that every product, material and item we are accustomed to using or consuming comes with an emotional attachment. I believe we are hardwired to perceive things a certain way by the memories we retain from using ,or in the case of the bacon, consuming in the past. Millions of products on the market have proven to be better than the original. 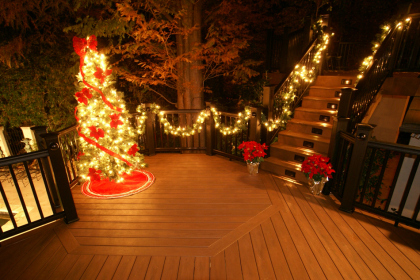 Much the same can be said about composite decking versus wood decking. Locked deep inside our memory banks is a fond memory that involves wood. It may be your mother telling you not to run around the deck of your backyard pool without your sandals because “you’ll get splinters”. It may be the warmth and aroma created from roasting marshmallows over a bonfire on burning hardwoods while at summer camp. It may be the warm, fuzzy feeling you get when you think of visiting grandma’s house on Sundays for fried chicken in her dining room with beautiful wide plank hardwood floors. Wood is part of our heritage. Wood promotes warmth, security and pleasantries within us. The beauty of wood is rustic, earthy and natural. It is only natural that composites emulate the look of real wood. After all you are getting the best of both worlds with composites, strength, durability and the aesthetics and graining characteristics of real wood, a winning combination indeed. 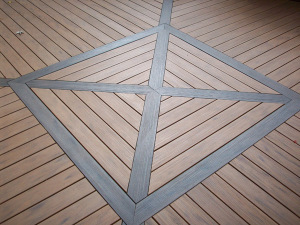 To find out more about composite decking contact Archadeck today. 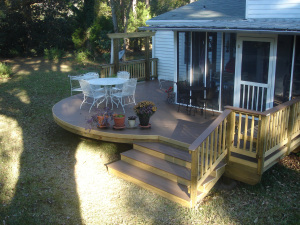 We can help you decide on the composite deck that is right for your individual tastes and needs. Call us at 888-687-3325 or email us at [email protected] and find out more about the Archadeck difference. Do you want to enjoy your deck and not have to think about splitting, cracking, staining, warping, discoloration, mold, or having to scrub it year after year? Guess what- you don’t have to. That’s right, with solid PVC decking and composite decking, to a degree, all these worries and chores are a thing of the past. 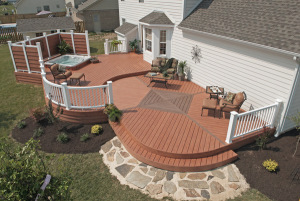 Composite decking such as TimberTech, AZEK, and Fiberon are worry free, strong, durable and beautiful as well. Archadeck is proud to build with these high quality composite brands to you along with our highly skilled installers and award-winning designs. Today’s composites provide you with the flexibility and freedom to create designs within the deck itself that just aren’t possible with woods such as pressure treated pine. The design possibilities are endless and are reminiscent of meticulous wood inlays. Composite decking now has the natural look of real woods such as Ipe,cedar and redwood to name a few-and you will never have to stain it. Today’s composites are also sustainable, being constructed to varying degrees, with recycled materials by using polymer technology. 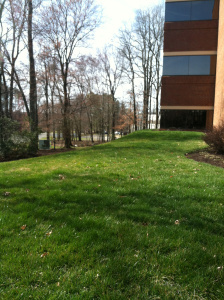 So you not only get a solid, and carefree material, you also get the pride of knowing your deck is eco-friendly as well. TimberTech’s Earthwood Evolutions has a 25 year stain and fade warranty along with its superior scratch resistance. TimberTech’s XLM composite is designed to withstand heavy traffic and is super slip resistant and a solid choice among composite pool, spa decks and general decks. 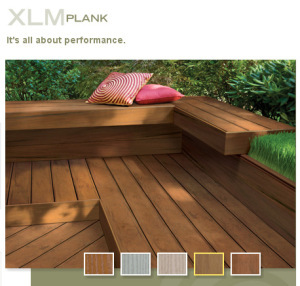 AZEK composite decking also boasts superior stain and scratch resistance as well as mold and mildew resistance. It is also long-lasting and durable and comes in many hues to suit even the most discriminating tastes. 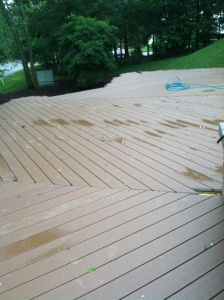 Fiberon decking has a 25 year stain and fade warranty as well as offering superior scratch, stain and mold resistance. It also comes in a myriad of true-to-life wood tones that you will have to see to believe. Homeowners make improvements to their homes for a myriad of reasons. Reasons include adding additional living space, remodeling to update a space or style, or upgrades to interior and exterior spaces just to name a few. Home improvements are classified as anything that makes a positive alteration to your home or your land. 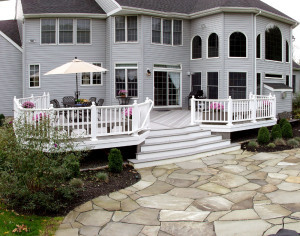 Today many homeowners are adding new decks and outdoor living structures to their list of improvements. When an appraiser comes to appraise your home before you put your house on the market, he takes a lot of information into consideration before coming up with that magic number. Appraisers look at land size, square footage, age of the home, the numbers of rooms, the type of home it is, the condition and the quality of the home, and the comparable value of all the other homes around you. Any type of home improvement that adds livable space of any kind, whether it is heated or unheated square feet, does increase your home’s value. 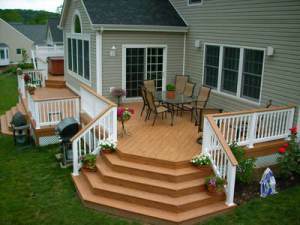 Building a deck for example, can greatly increase your home’s value. Some research shows that up to 75% of the deck cost can be recouped if the home is sold within a year of adding the new deck. Even if you don’t have a lot conducive to adding a deck, a patio is also a solid choice for sellers looking to re-vamp their backyard in preparation to put their house on the market. Any structure that adds character to your home or land will add value. Any structure that makes you stand out above the competition will add value, and also help get your house shown more often, and thus, sold quicker. You have to think in terms of relativity to the competition around you. 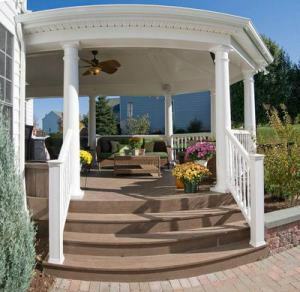 Adding an outdoor structure such as covered porch, a gazebos or a pergola can add enough character to make your home stand out from all the rest. Think in terms of the potential buyer’s standpoint, they are going over the houses they have been shown and have to choose from in their price range and they come across yours by memory in their conversation…" yes, that was a nice home, lots of open space, well maintained interior, right amount of bedrooms and it had that beautiful backyard with that lovely covered porch, nice". An addition such as this can often make such a positive impact on your home that the chips will become stacked in your favor. When Curtis & Ann Crays of Archadeck of Front Range, CO first talked to their eventual sunroom customer, the empty nesters had nothing but a swimming pool in their backyard and it was something they no longer needed. What the homeowners wanted was a room addition where the swimming pool used to be. They wanted a room on the back of their home. They also wanted some open outdoor area. 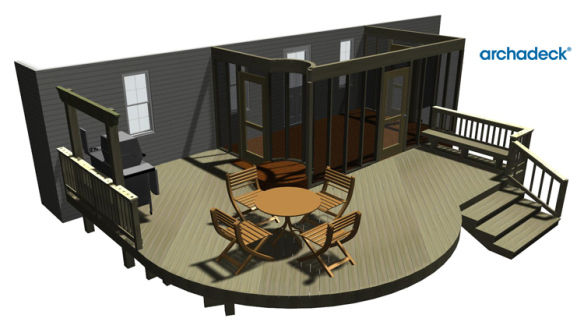 So Curtis and Ann designed a 16×18 sunroom with two different decks totaling roughly 330 square feet of decking. 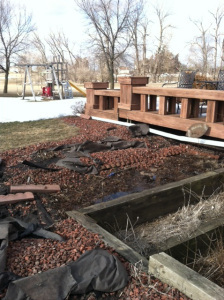 Here is a picture of the backyard after filling in the pool and before building the sunroom. Before Curtis & Ann got the crew started, they designed a rendering of what the room would look like to share with the homeowners. This serves a couple of benefits. 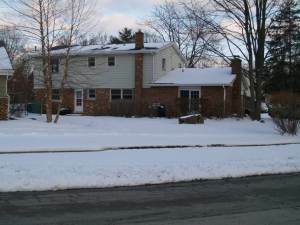 First, the homeowners really can see exactly what they will be getting so they can make any desired changes up front. Then, it leads to everyone’s expectations being fulfilled because the visualization of the project is not left to interpretation. It’s right there in black & white so to speak. 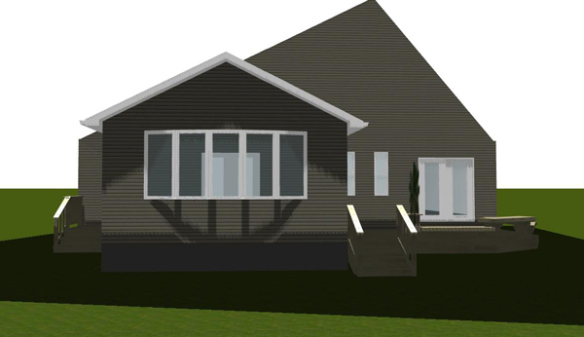 Here is a picture of the design rendering. 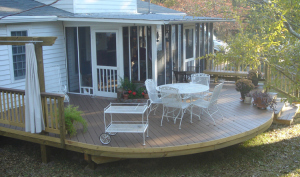 The decks included Timbertek Reliaboard decking with floating benches. They used Colorado custom window builders Accent Windows. The sunroom also included skylights by VELUX. You can also read their blog https://customdecksdenver.wordpress.com/ or visit them on Facebook.